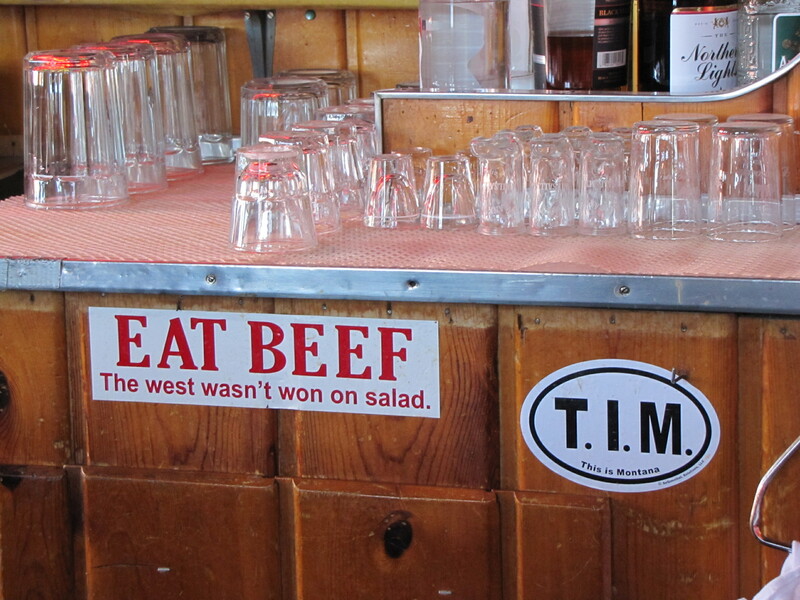 Loving Montana | how's it going, eh? I am officially in Canada!!!! Calgary, Alberta to be exact. I have a lot of posts to catch up on due to the fact that I was plain pooped out from the road trip. So, without further ado – let us continue with Montana! What better place to spend Fourth of July, but in Montana! We woke up in the morning taking our time getting all our bags + the car re-packed, because it was becoming a big ol’ mess. After all that organizing we were starved. The night before we saw a tiny place called, “The Other Cafe” in a forgettable strip mall + thought we’d give it a try. When we walked in it was like, “SCCCCCRRRRRCCCCHHH!!!! !” like the needle on the record player – everyone in the joint stopped talking + stared at us as we walked in. We might as well have looked like aliens from “Mars Attacks” because everyone in the cafe was looking at us like we were from a different planet. It was totally locals only brah. 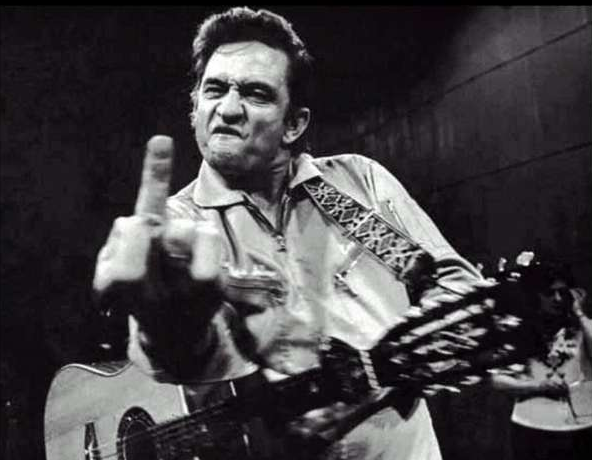 There was a family enjoying their Fourth of July breakfast + grandpa was sitting at the head of the table wearing a black t-shirt with Johnny Cash flipping the bird. So classic. Here’s a sneaky pic Jeff took of this mean looking sonofagun that was sitting behind me solo enjoying his steak + eggs. 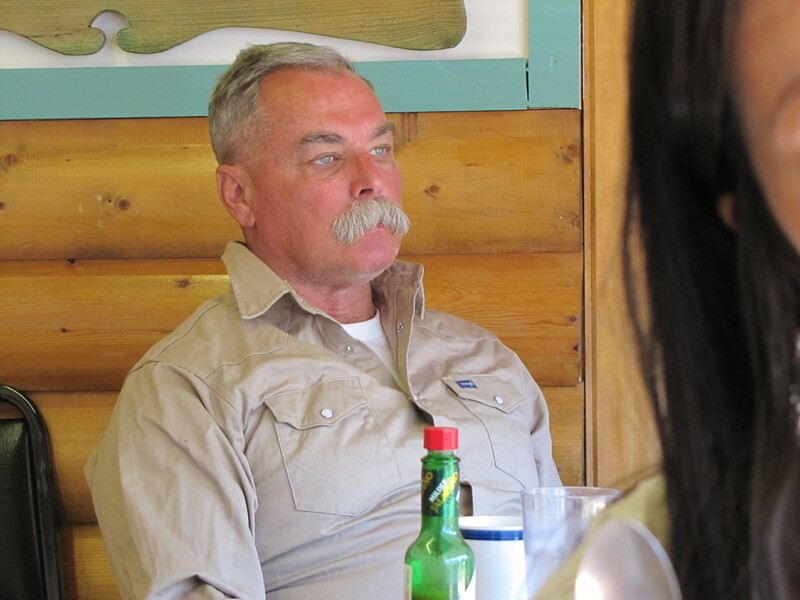 Those eyes have seen things that most men couldn’t ever imagine…..I think when they said, “Don’t Mess with Texas” they meant, “Don’t Mess with Montana”. Because this dude was like a bounty hunter or something. 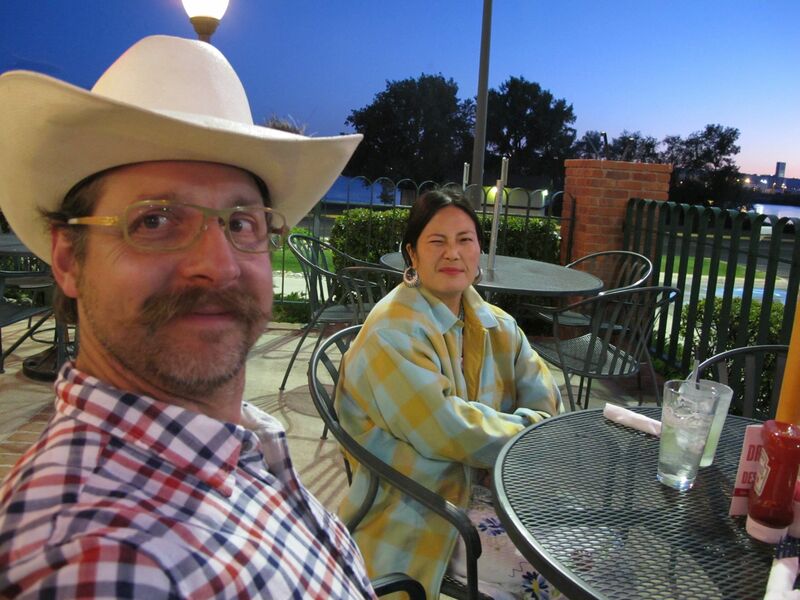 Well, everyone settled down after they realized that we were actually going to stay + the waitress was sweet as punch! 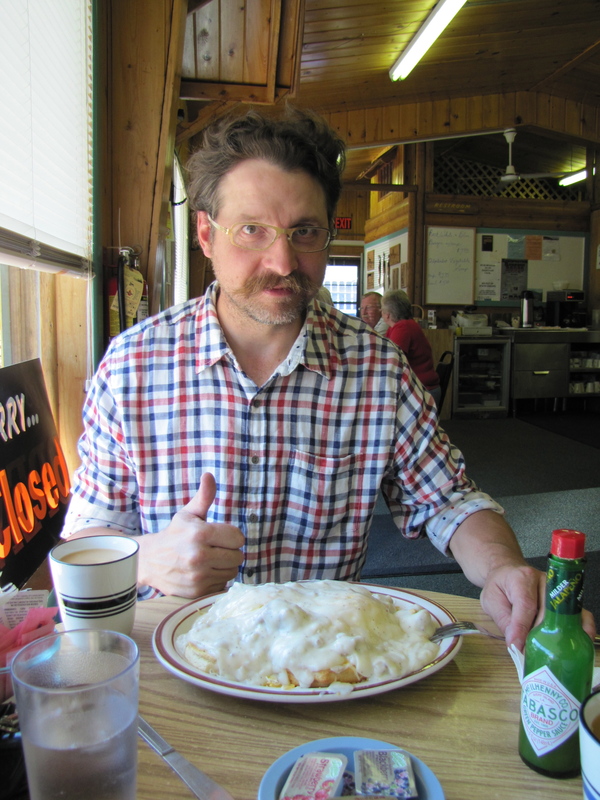 Jeff got their famous “haystack” + oh my lawd!!!!! Underneath all that delectable gravy was biscuits, hash browns, eggs, sausage + cheese!!! It was gooey heaven!!! “The Other Cafe” is a serious Livingston thumbs up!!!! Do you like Jeff’s red, white + blue shirt for the 4th? After our filling breakfast we wandered around town. 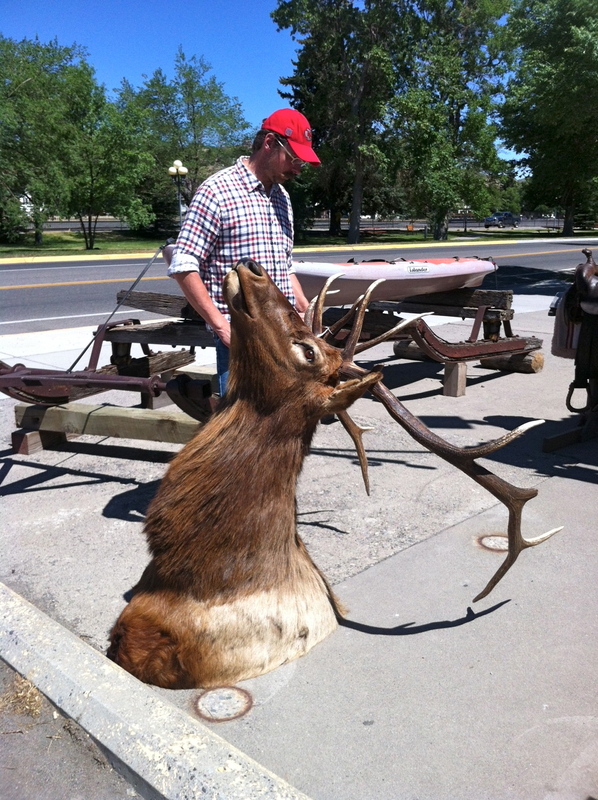 Where else are you going to find a taxidermy elk buck’s head just lying on the sidewalk? Elks are huge-mongous. It makes me so sad to see something so majestic lying there on the concrete. As we drove along, we came upon the “Native American Nations” trading post! This place was a gem! I was freaking out! 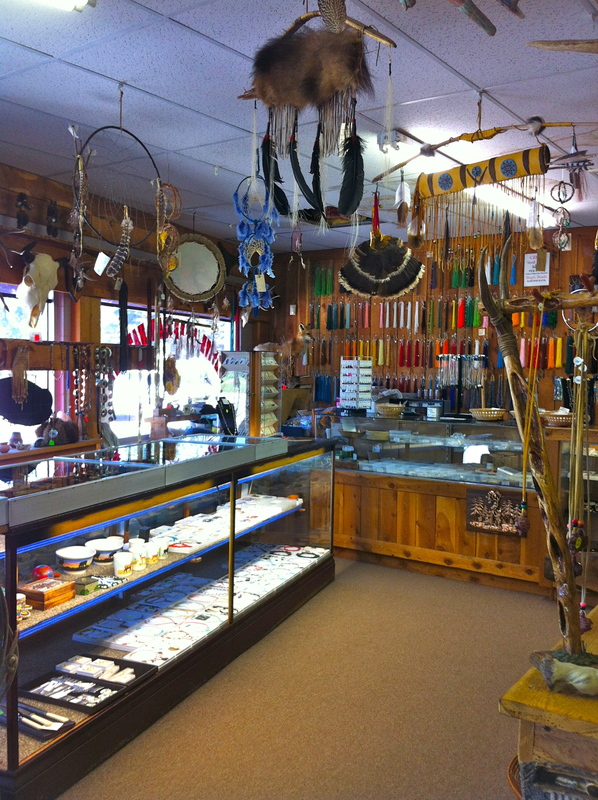 The shy + awkward British lady behind the counter said, “It’s so nice to meet people that are so into Native jewelry.”. Hello!!!!! If this store was in Southern California it would make a killing! Of course I picked up some turquoise – need you ask?! Prices were amazing!!!! An enthusiastic thumbs up from moi!!!!! Guilty as charged!!!! 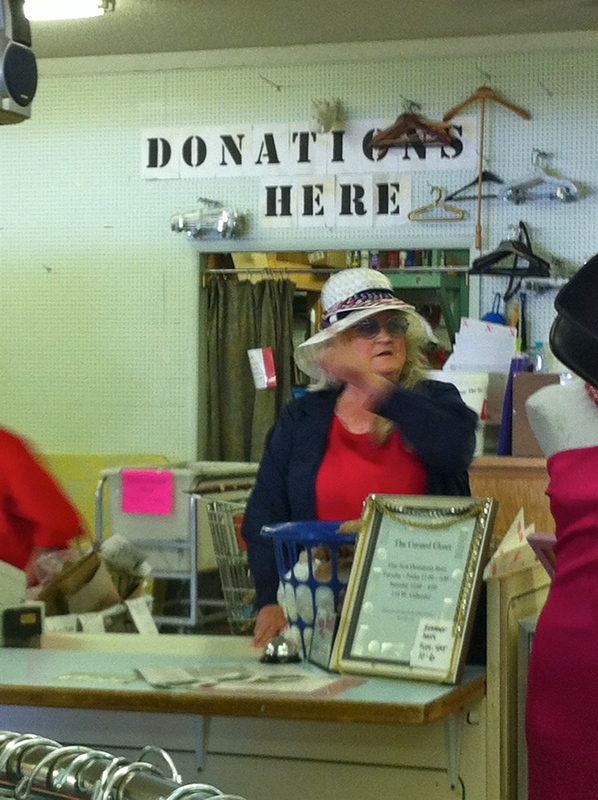 Thrift store open on Fourth of July in Montana?! We’re SO there!!! 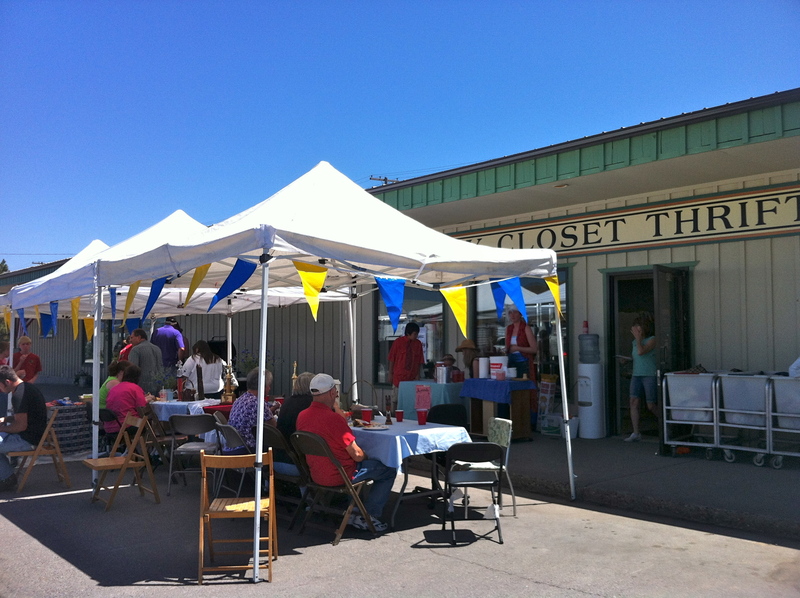 This is how they do it at thrift stores in Montana for the Fourth: free hot dogs, lemonade + ice cream!!!!! Oh yeah!!!!!! This place was a goldmine, y’all!!!!! I can’t even begin! Well, let’s begin with this lady all done up in her patriotic colors! Okay readers, let’s take a poll!!!! Doesn’t Jeff look so cool in plastic frame, black vintage glasses?! Let me know what you think! 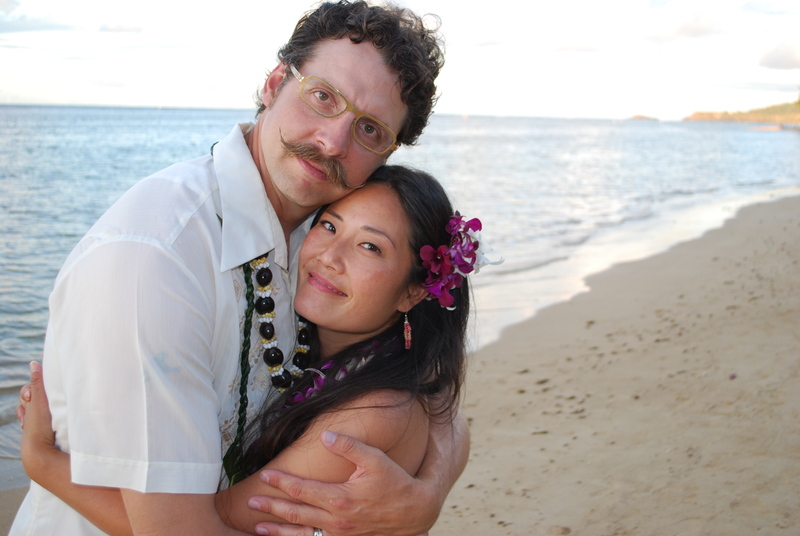 Believe you me, it’s like pulling teeth to get Jeff to wear frames like these! You would think with his 50’s obsession that he’d be all over these frames like a moth to a flame! 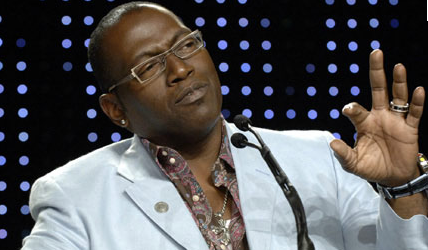 But for some reason, he gravitates towards what he thinks are “artsy” frames which just make me think of Randy Jackson from “American Idol”. 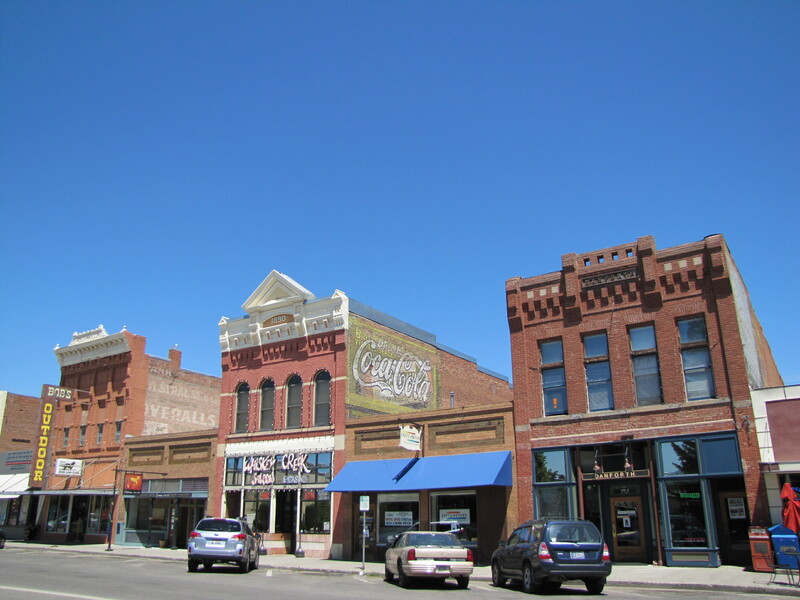 Downtown Livingston is full of historic brick buildings. I’d love to hang out there on a non-holiday when all the stores are open! There were some stores I was dying to get into! Our find of the day was the “Robert Osborn Gallery”. Jeff nailed it when he walked into Robert’s gallery!!!! We spent a couple of hours talking to Robert – he’s from Watts, California yo!!!!!! And he doesn’t miss Los Angeles one bit! 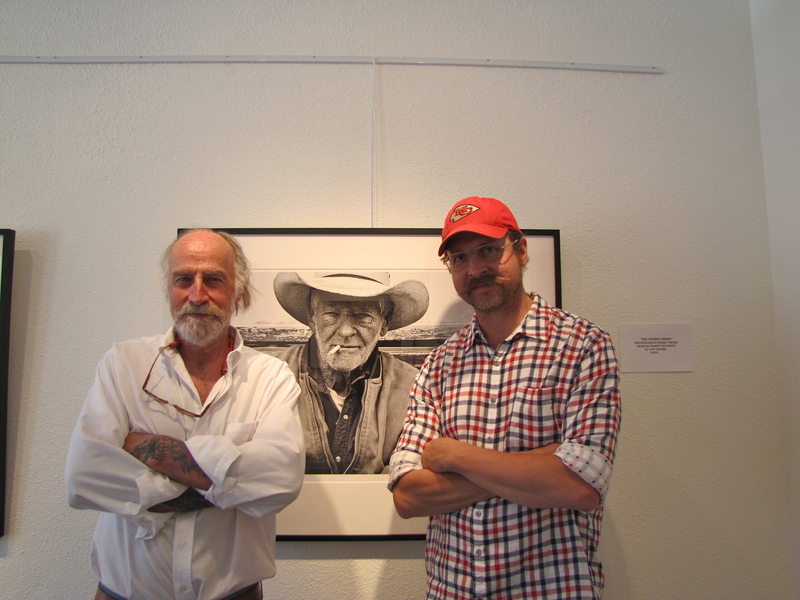 His current portraits, “Cowboy Series” were full of emotion, texture + a story behind every face. Robert was the coolest guy! He was so interested in our lives, chatted with us about his photography concepts, methods, passions + shared the intimate lives his subjects lived. 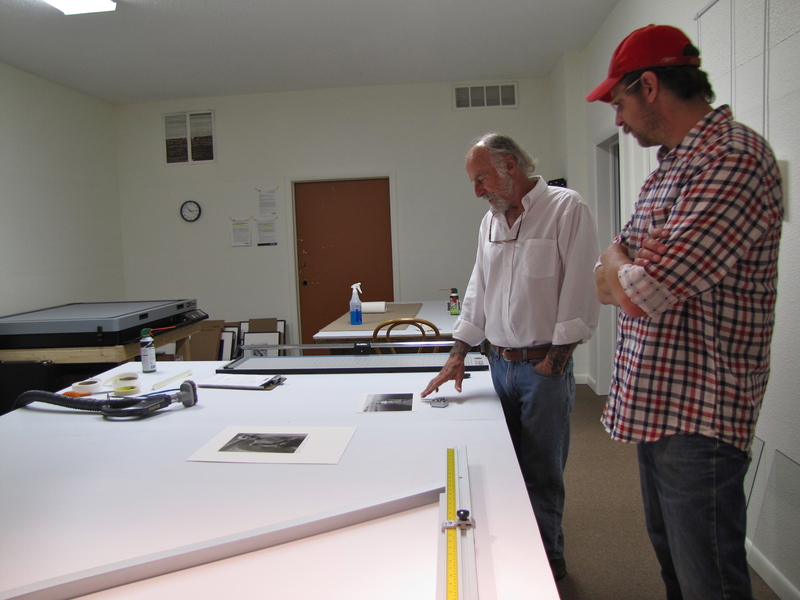 We walked away with two extremely reasonable prints from the “Cowboy Series”. I can’t wait to put them up!!! 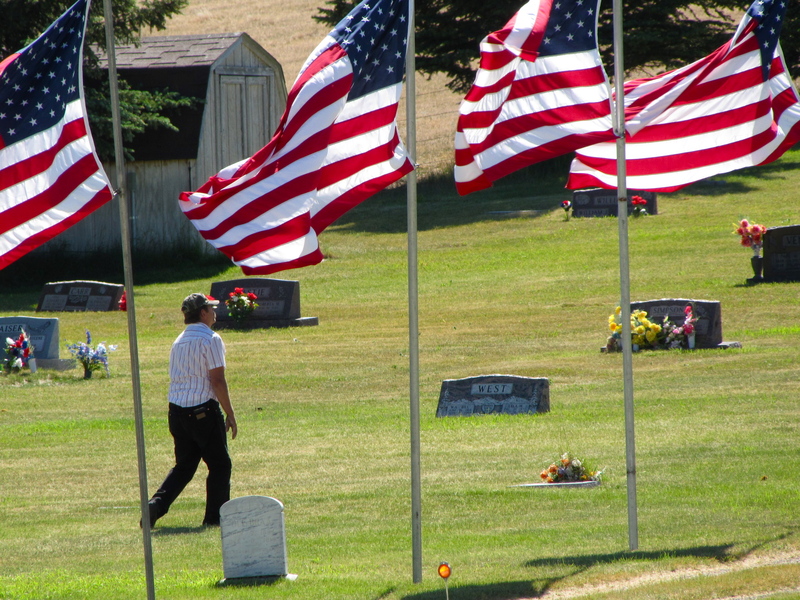 Along the Highway 89 heading north, there was a little cemetery with flags surrounding it, waving strongly in the wind. There was only one man tending to his loved ones’ grave. I couldn’t think of anything more patriotic. 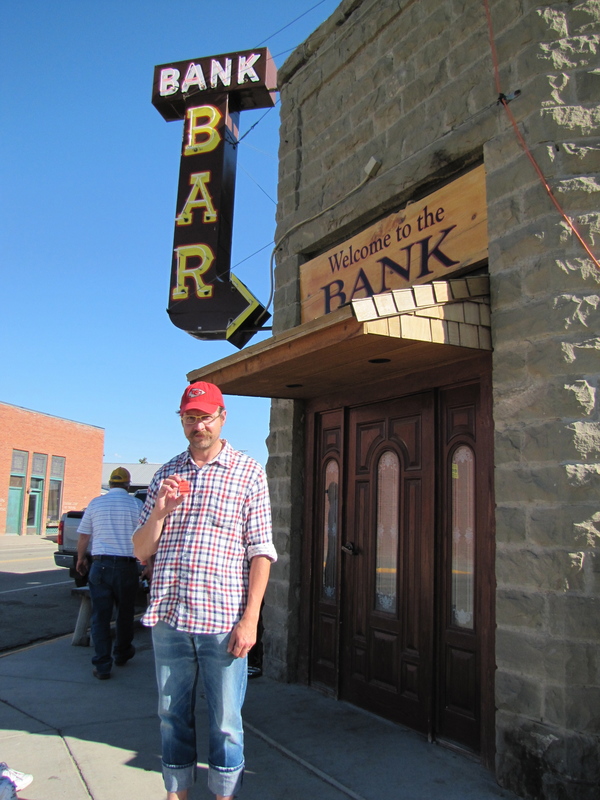 Robert told us on our way up north to stop by the tiny little town of Wilsall + quench our thirst at the “Bank Bar”. 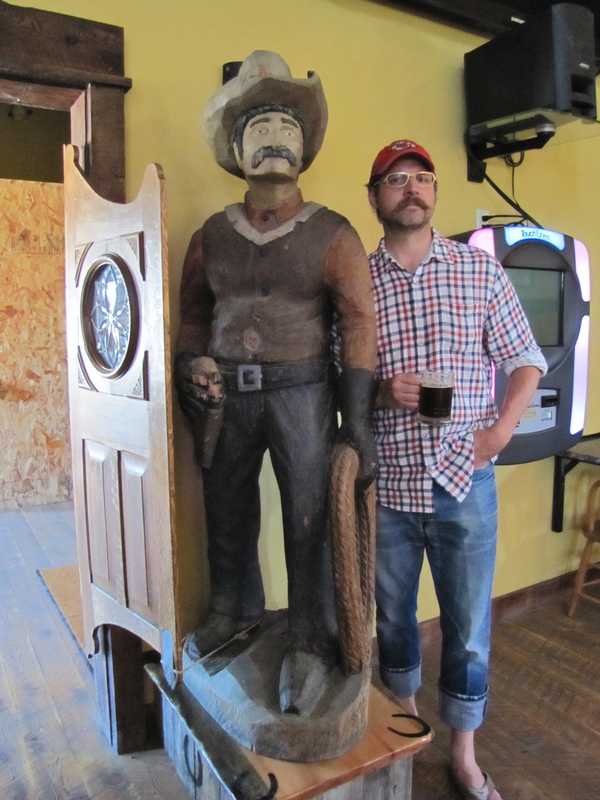 It’s an old cowboy bar that is literally built out of an old bank. The locals there were also super duper nice!!! Obviously we’re from out of town! One lady asked us what we did for a living + when we told them we both worked in the film industry, a cowboy came up + said, “Excuse me, I couldn’t help but overhear that you two worked in film”. Turns out he was a gaffer + animal wrangler! Small world!!! They told us stories about a neighbor who raised a brown bear from infancy. One day his grand-daughter wanted to ride in the bear cage in the back of the truck. So they drove around town with grandma + the grand-daughter in the bear cage, while the bear sat in the passenger seat!!! I LOVE Montana!!!! Another 2 1/2 hours later + we arrived in Great Falls, Montana to the “O’Haire Motor Inn”, home of the Sip ‘N Dip Lounge. Our entire reason for staying in Great Falls was for the Sip ‘N Dip Lounge. This Lounge is famous for their “mermaids” that swim behind the bar as you drink cocktails. Unfortunately, mermaids get vacations (darn mermaid union!) + they were off for two days. But yet, the O’Haire didn’t disappoint! This place has not been re-decorated since the early 80’s!!!! 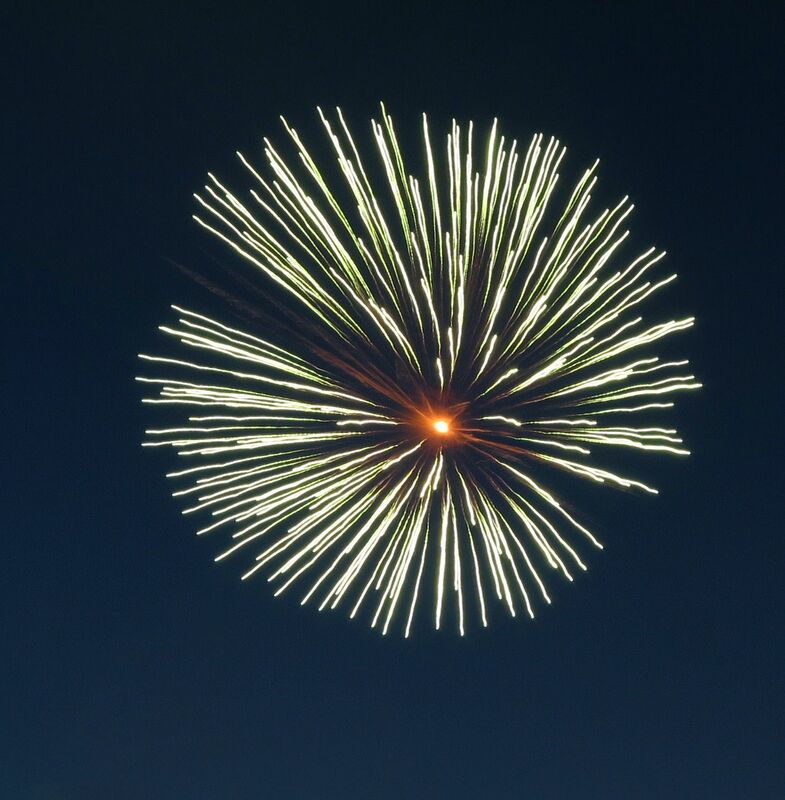 We walked 7 blocks + watched fireworks from the Applebee’s patio + it was perfection. I am now officially obsessed with “Buffalo” style chicken anything. After fireworks we took advantage of the 80’s decor in our huge hotel suite at the “O’Haire Motor Inn”. 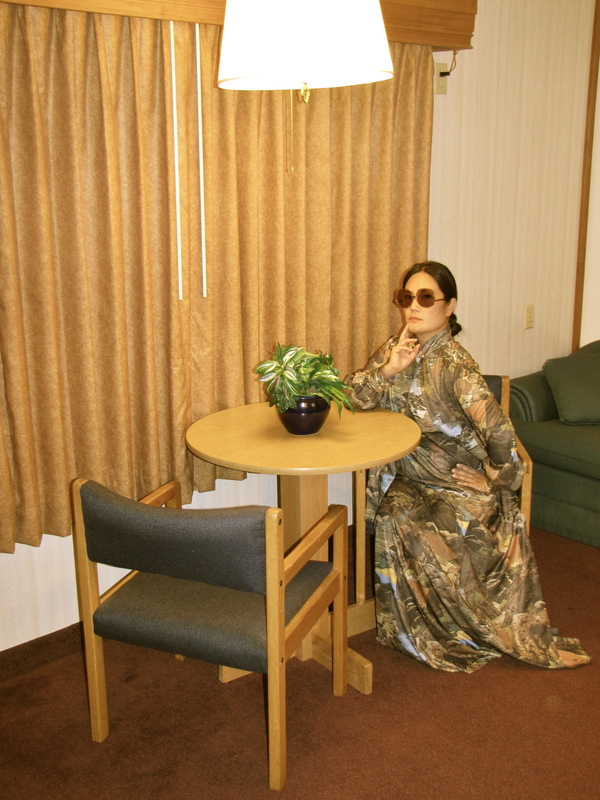 I put on one of our thrift store scores: a 3 piece handmade photo print maxi outfit we found that day + sunglasses I found in Idaho. 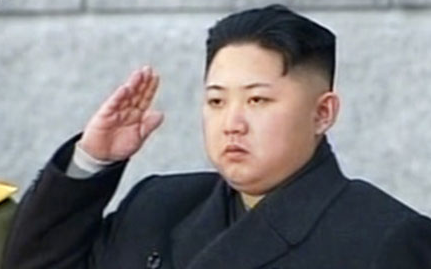 I look like the future wife of Kim Jong Un, but whatever. I was trying for glamor. More Montana fun awaits, stay close to your screens!!!! Love the 70s glamour shot! Very retro-fun 🙂 I’m curious though – what are the three pieces? It looks pretty seamless in the photo. It is a Mandarin collar jacket, a shell tank + a maxi skirt!!!! OMG – your blog never ceases to entertain… I wish I could be on all these road trips with you guys. 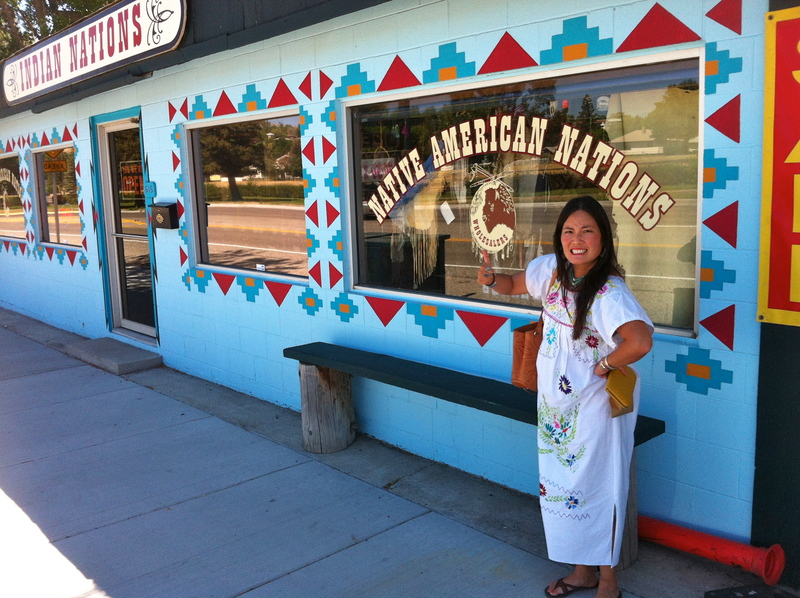 It looks like too much fun: Thrifting, native indian jewelry, local food – Oh, my!!! Also, Love the glamour shot! You would DIE over the thrifting!!!!!!! Very dangerous…. HAHAHAHA!!!!! Thanks, Deb! I need more votes of persuasion for Jeff to make the switch! Vintage plastic glasses = yes! Alright! Another vote for vintage eyewear!!!! Love it! Thanks, A!!!! Glad you loved Montana. I love it too and I live there! I LOOOOOOOVE MONTANA!!!!! Especially the locals!!! You’re so lucky! Keep having a fun trip. Lv you and Jeff. That’s some good engrish, mom!!!! Thanks !!???? , that’s who I am!!!! of course YOU would find turquoise at an indian trading post in the middle of montana where the counter was manned by a little british lady! stop making me miss america!!! Yesssss!!!! 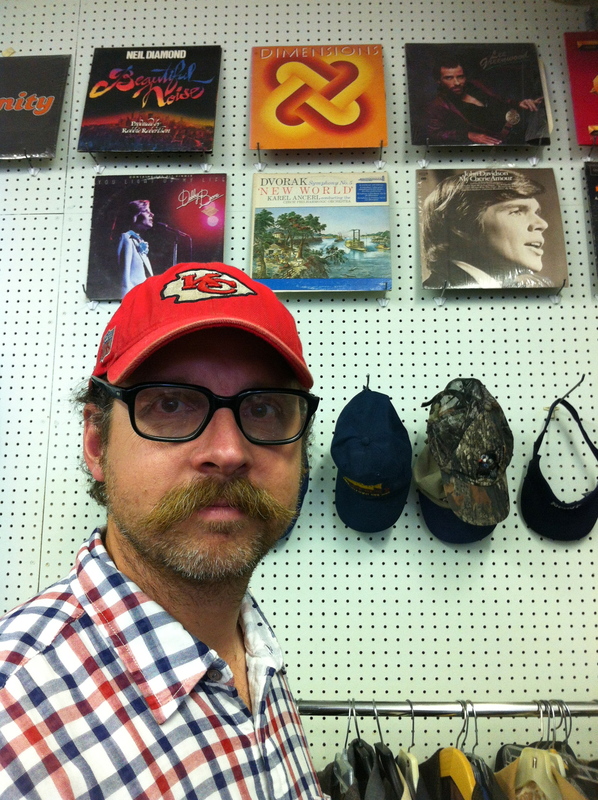 Yet ANOTHER vote for vintage glasses – thanks homie!!!! Taking a poll was a fantastic idea!!! North America misses you greatly!!! Another vote for the vintage black glasses! 🙂 Also love the glamor shot, you look like Mommy in that picture! Love and miss you! Wooohooo!!!! Jeff is defeated!!! A unanimous crushing defeat!!! I look like mom? Haha!!! Love + miss you too!!!! Hanging Up Pictures | how's it going, eh?